This ancient port was founded as a Phoenician settlement and was eventually taken over by the Romans. Visitors can stroll among the seaside ruins that include public baths, houses and charming theater, used for summer concerts. Only disappointed that we did not stop to get photos of the flamingos that they posted in the excursion info. We loved being guided thru the ruins and learning about ancient times. We loved being guided thru the ruins and learning about ancient times. Very, very interesting. With Shore Excursions - great tour with 12 people, guide really knowledgeable and Nora was great to see (small group again made it easy). The given the choice of drive or old city walk. As temp was 40C+ went for drive around. Our tour guide was amazing! Our tour guide was amazing! It was easy to tell that she was extremely knowledgeable and passionate about her city/country and Nora. Tour not well described. Literally a hike around not terribly impressive ruins and a drive through Cagliari - not really The Best of Sardinia. the Park of Nora was amazing. the Park of Nora was amazing. 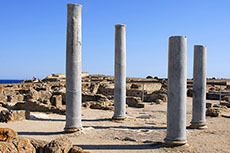 In addition to seeing Roman ruins, one has the opportunity to see Phoenician ruins in an amazing seaside site. Our guide was very knowledgeable and added to the educational element of this excursion. The best tour we took and very enjoyable. This was educational, but the planned trip to Paola after visiting Nora was a waste - everything was closed for the afternoon - so we returned to Caglieri. Nora was quite cool, though compared with Pompeii and Tindari, not nearly as impressive.